In this case we have organisms which are either poisonous or venomous. 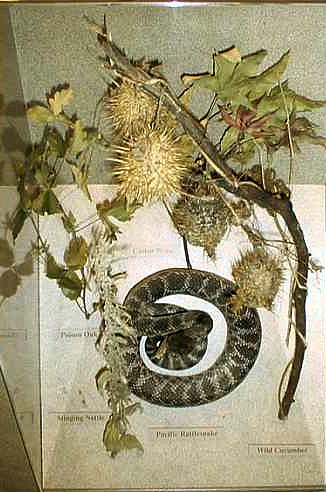 Here we see poison oak (upper left), wild cucumber (balls with spikes at top center), castor bean (large leaves at upper right), stinging nettle (lower left), and a pacific rattlesnake. What's the difference between poisonous and venomous? These plants are poisonous because they spread their poison either by contact with the skin, like poison oak and stinging nettle, or by ingestion (swallowing), as in the case of all four. The rattlesnake is venomous because its toxin must enter the bloodstream, usually by injection with its fangs. Simply touching rattlesnake venom will not harm you unless it can enter your body through a break in the skin, such as a cut.